Most people use their garbage disposals every day without giving it any thought. But eventually, garbage disposals can become clogged because of food waste that affects the waste line or the trap. Usually, the clog starts because of how the water (or lack of water) interacts with the food waste itself. If you have a clogged garbage disposal, you’ll probably find the problem in the discharge side of the disposal. Looking for a DIY way to fix your garbage disposal? Click here. Not putting enough water down the garbage disposal when it’s grinding is a sure fire way to get a clog. 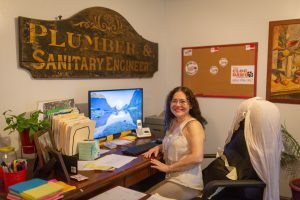 Over time the lack of flushing water does not carry the waste material fully through the drainage system and it builds up in the drain lines. 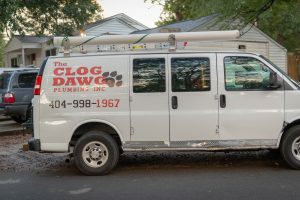 Grinding egg shells or coffee grounds will create very tiny granular waste that will stick to any sludge in the pipe and quickly create a clog. Potato peels are notorious clog makers. Once ground up, they form a starchy paste similar to mashed potatoes and quickly clog the drain. Banana peels are similar to potato peels except they add stringy fibers to the starchy paste like mess. 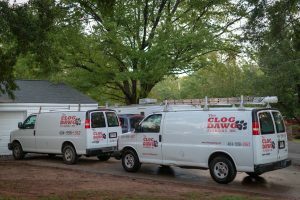 Sometimes no matter how much you try to maintain your garbage disposal, there will be a clog that is not easy or convenient to remove. 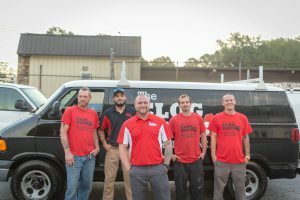 The Clog Dawg’s professional plumbing team is there to help you when clogs are at their worst. Call us now to take care of it. Have a garbage disposal question in the Atlanta Metro or Cobb County?